1968 The 1968 Golden Nugget Special or Golden Nugget Limited Edition Mustang was an Oregon/Seattle promotion which took a 1968 hardtop and offered it in Sunlit Gold (color code Y, usually followed with a "5" to indicate the black hood, and special order number 1111 after the 74 DSO found on the door data tag) although any of the standard or special Mustang colors could be ordered. Also with this package came the louvered hood with black painted inserts, black vinyl top, a black interior, and featured unique golden plaques on the dashboard with the original owner's name engraved. 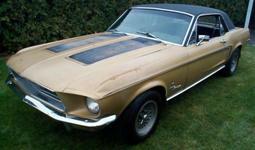 481 Golden Nugget Limited Edition Mustangs were actually produced of the 525 scheduled to be offered through the promotion.